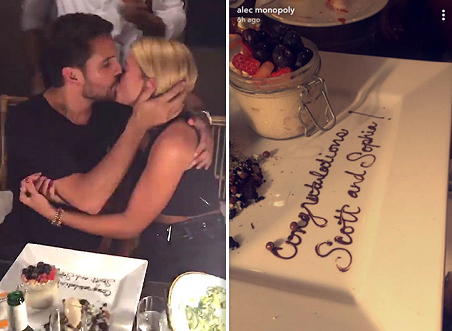 Scott Disick and Sofia Richie kissed passionately as they got ready to slice into a cake inscribed in frosting with the words, "Congratulations Scott and Sofia" ... and that raises some big questions. The two were all over each other at a Miami restaurant last night, and it clearly was not a spontaneous event. The cake and everything else about it seems like a pre-planned celebration. Sources say Scott, 34, and Sofia, 19, are not engaged. However another source says it's the announcement that they are officially boyfriend and girlfriend.